“The digital divide is growing, however, as the Apple Watch Series 4 released last month added an alert system for when the wearer falls down and a function designed to identify heart irregularities. Analysts say those features target a demographic of faithful watch buyers who are typically more resistant to technology: older customers,” Erheriene reports. 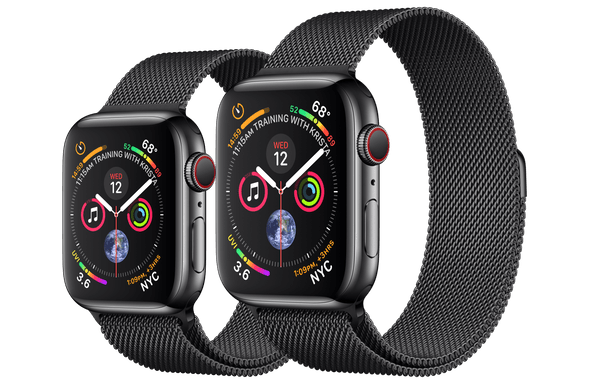 “Swiss watchmakers that operate in a price category similar to Apple—the Series 4 starts at $399—are feeling the pain of Apple’s competition, with the number of loss-making companies in the low to midrange market rising, according to the Federation of the Swiss Watch Industry. MacDailyNews Take: Trying to catch up to Apple is a fool’s errand. The apple watch as mad all of us into tamagatchi care givers. I do wish apple made a great hybrid watch as I do like the stylings of a mechanical watch but don’t actually check messages, make calls or utilize much other than fitness tracking and activity monitoring when I bike and run or ski on my apple watch. I understand that I am in the minority as most people would love to just replace their phone with the apple watch. While you can’t change the look of the watch, you can certainly change what it does. I don’t regularly make calls on my phone or message from it. My complications are battery, time, weather, activity, timer, and date. However, I must say that, in a pinch, having the capability to send messages or use the phone is a literal life saver, so I don’t think they’ll remove that. Unfortunately, for the mechanical feel, you’ll have to choose one of the mechanical companies watches. There is something to be learned from what started happening a bit over a hundred years ago that is relevant. The Model T started taking over from the Model “H”orse. Suddenly horse, hay, saddlery & buggy whip sales went down. You didn’t see any of those suppliers switch to making the Model T+. I don’t see the mid-range watch suppliers “making it” beyond 2020. Those mid-range watch companies don’t have the cash or knowledge or manufacturing to support what goes into an Apple Watch. Some of the brand names will survive no doubt but attached to cheap Chinese imports. The ultimate sell out. The Apple Watch is a wrist strapped gadget, albeit a good one. It is a lifesaver, literally as someone mentioned. Someday more sophisticated comparable devices will be as necessary as a mobile phone is today. There is no comparison, however to a finely crafted mechanical watch, which is a piece of art to be appreciated through the ages. The Apple Watch is appreciated for about a year until Apple adds some new “complications”, adds some silly feature, and it gets bumped up a version. 50 years from now today’s AppleWatch, if still around will be a curiosity, while a Rolex. or Jaeger-Le Coultre, or Patek Philippe, or Omega, or TAG Heuer. or Breitling will still be cherished. “will still be cherished” by maybe a few hundred thousand collectors worldwide (including me). But mechanical watch sales will be a pittance compared to the Apple watch which will sell hundreds of millions in a decade. And compared even to the contemporary creations of TIMEX, the AppleWatch for all it’s compressed digital magic, still looks like something fished out of a carnival claw machine. Just wait till Apple releases the ECG/EKG software for the 4 and it starts catching on. No wonder Mark Wilson makes his blog private who else would bother to read it. All well and good, but isn’t the problem for smartwatch makers is that new Qualcomm SOCs are only released every once in a blue moon? How are they going to keep up? I’m somewhat surprised Samsung doesn’t start making smartwatch SoCs in order to undermine Apple’s product. I suppose even Huawei could design it’s own smartwatch SoCs as it did with the 7nm Kirin 980. Anything Apple does, I’m sure will be torn apart and copied by companies dying to dominate in market share percentage. One would think that with as much money as Apple has to spend, no one would be able to keep up with them, but I suppose there’s more to staying ahead of the competition than just money alone. Apple needs to stay hungry to destroy the competition.